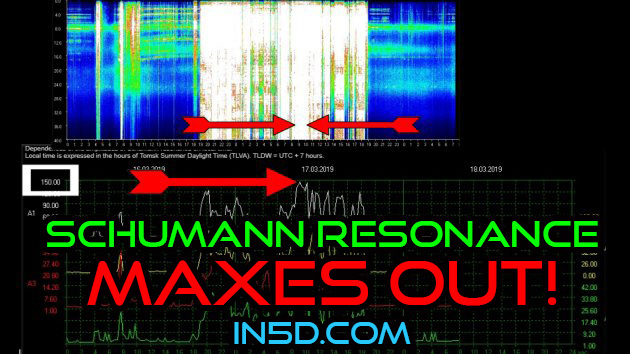 Schumann Resonance Amplitude Maxed Out At 150! The SR frequency differs from the SR amplitude, although a rise in one generally means a rise in the other. The average SR frequency for our planet is 7.83. As the frequency rises, we will see changes happening on many different levels, including, spiritually, mentally, and physically. In conjunction to Earth moving into the Photon Belt, we will continue to see a rise in Schumann Resonance anomalies as Mother Earth is being continuously infused with photons. These photons usher in transformation on both spiritual and physical levels. What we are witnessing are the precursors to The Event. The most obvious sign is when the sun turned form yellow to white as we began entering the Photon Belt. This, in turn, will cause The Event, which in my opinion, is when white light FLOODS the planet. You’ll feel the feeling of love magnified 1 million times more than anything you’ve ever loved. Some call this Christ Consciousness. I saw and felt this in a vision in 2014. It’s REAL and it WILL happen. The times we are currently living in are EPIC! Please remember to stay GROUNDED as much as possible. Tags: Schumann Resonance Amplitude Maxed Out At 150!